With posting on the event wall only 10€ till midnight. From the humble streets of Deeside Trelawny to the rigid livity of several inner city communities, to various places around the world, for the artiste ‘Darrio’, music has always been the driver. Born in Deeside Trelawny to parents with heavy musical background, Darrio moved to Kingston at the age of 7, bouncing around inner city several areas such as Franklyn town, Allman town, Red hills and Bull bay until he finally settled in Harbour view. With music in his veins, Darrio was always in the mix at concerts, socials fetes and parties throughout his school days at Franklyn town primary and Clan Carthy high. But it was his participation in community events and national competitions that led him to choose music as a profession. Darrio, naturally a skilled and witty performer, and under the guidance of then manager Dj. Billy, won over crowds all across Jamaica in various competitions such as Guinness Undisputed and Sting Star-maker. Success in these competitions led to his first opportunity to perform on a major stage show at Sting 05. But circumstances beyond his control led to an abrupt pause in his musical career, shifting his focus on maintaining his 9 to 5 job. Close friend, mentor and veteran dj Pappa Biggy introduced Darrio to Richard Burt of Nocturnal Productions. Darrios’ charisma and passion for musical success sparked Mr. Burt’s interest in the budding star and began to seek professional recording sessions, stage shows, interviews and other medium to expose Darrio to the public. With this exposure Darrio recorded and released his first official track titled “SHUB OUT”. In an effort to find a studio and production home, the high spirited duo of Darrio and Mr. Burt went to Natural Bridge Studio which then housed talents such as Ward 21,Tifa,Timberlee, Natalie Storm and another budding young star, Konshens. This introduction turned out to be a turning point in his career as he and Konshens became close friends and co-workers. The bond between KONSHENS and DARRIO grew significantly as Darrio brought a higher spirited and enthusiastic vibe to the table and introduced the “fun factor” to the then calm and “all about the paper” Konshens. Konshens in return, relayed his knowledge of the music as a business as well as tips in recording techniques and lyrical content. Through this friendship, Darrio was given his first opportunity to travel overseas in the name of music, and has since become a present figure in all activities surrounding Konshens. 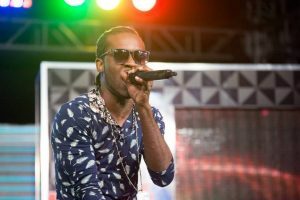 The split between KONSHENS and NATURAL BRIDGE did not hamper the friendship of the artistes as they remained friends and continued on their quest for the coveted prize of musical greatness. Now, after several singles including the popular ‘Russian’ produced track “DO DI TING” on the Go-Go club riddim, and “HOOKED ON YOU”(for the ladies) produced by Ricky G for Vertex productions, both collaborations with Konshens, Darrio is receiving heavy radio rotation and the much desired buzz and popularity in the streets with appearances on many popular stage shows including Sting, Spectrum and RJR cross country tour to name a few. Armed with lyrical versatility and charisma that leaves a mark wherever he goes, Darrio is prepared to take on the challenges that he will face on the rest of his musical journey. Razor B- Jamaican born and Canadian breed, Razor B is the complete package; dancehall dj, song writer, producer and entertainer. Razor B is what is missing from the dancehall music scene. Versatile in his ability to create songs that resonate with both the young and old, Razor B’s silky smooth style and rough edges reach wide and deep. With years experience Razor has built a reputation as a performer, earning the title as the ‘Girls DJ’. Razor B has risen to dancehall stardom with a number of Top 10 Reggae Dancehall hits under his belt, including Hot Up, Up in Deh, Bruk Back, Beet Root, Whine Drop Dip, Happy Moment, Don’t Stop It, Turn and his summer hot single We Nah Lef produced by the infamous Sean Nizzle; Razor B has solidified his place in the dancehall fraternity. In 2016 he earned himself 3 YVA nominations and wont for Hot Up! Winning Summer Song of the Year, in 2017 he brought home the CUT Hip Hop Award for Reggae Single of the Year for his hit song Happy Moment and the ReggaeXclusive Trailblazer Award for his achievements in Dancehall music with the song ‘We Nah Lef’ in July 2017. September 2017 Razor B won the Caribbean Music and Entertainment Award for International Reggae Artist.